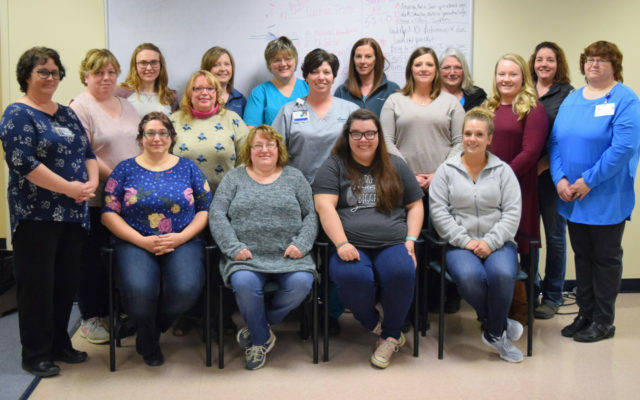 In an attempt to fill a gap in the healthcare field in Aroostook and beyond, this spring NMCC launched a new program in Houlton, training practical nurses (PNs). HOULTON, Maine — In an attempt to fill a gap in the healthcare field in Aroostook and beyond, this spring NMCC launched a new program in Houlton, training practical nurses (PNs). The brand-new cohort currently has 16 students enrolled in the 45-week program based out of the Houlton Regional Hospital. The program is the only of its kind offered by a public institution in the state of Maine. The possibility of a new program first came to light when Rob Moran, the executive director at Community Living Association, also in Houlton, notified NMCC about a shortage of nurses in southern Aroostook. “I picked up the phone and called President Crowley at NMCC and he was very open to the idea and it went from there,” Moran said. After 34 years working for the Community Living Association, Tonia Shaw took the opportunity to go back to school and advance her license. “I’ve wanted to go back forever,” Shaw explained. “I went to UMPI for phlebotomy and graduated last October, and it just made me want to go further.” Shaw’s goal is to work as an PN for two-to-four years before going for her RN license. “We really appreciate how responsive NM was, and everybody involved. We’re thrilled it’s happening and even more thrilled that it’s taking place in Houlton,” Moran said. “The development of this program has been a successful combined effort between health care facilities in southern Aroostook, NMCC, and the Maine Community College System’s Quality Centers Program,” said President Crowley. For more information about the new PN program please visit nmcc.edu.